Just wanted to pop in and wish all you peeps a HAPPY EASTER! The star of this card is the little chick from A Good Egg, which is, of course, retired. But, I will never, never, never give up this adorable little guy. Never!! I stamped the little guy onto yellow cardstock in Black StazOn. (Believe me, this stamp really gets a workout! Stay with me . . . ) To give the illusion of an egg shape, I used the Ovals Collection Framelits to cut him out. The egg portion was stamped twice for each card on a sheet of retired Stampin' Up! DSP. I cut out two egg halves for each of the nine cards I created. I grabbed another retired stamp set to create the cute polka dot leaves for the tulips, stamping it twice on each card in Gumball Green. At this point, I ran the light blue through the Big Shot inside the Perfect Polka Dots embossing folder. To continue the dotted tradition, I turned to the Polka Dot Parade DSP in Marina Mist for the clouds. I used the cloud-like shape from the Word Bubbles Framelits Dies found on page 36 of the Occasions Mini Catalog. I cut two clouds for each card. But the cloud on the far right hung over the edge, and after I cut that off, I added it to the far left edge. See? It actually looks like THREE clouds in the sky! For the tulip flowers, I used -- once again -- A Good Egg. Yup. The tulips are the eggshell again, but this time on orange. After cutting them out, I adhered them to the tulip stems. Isn't this becoming positively REALISTIC?? Our chick-let had something to say right after hatching from his colorful shell. So I once again used the Word Bubbles Framelits for his little white "hello" bubble. The grass was created from Gumball Green cardstock with the new Fringe Scissors on page 31 of the Occasions Mini. After gluing the yellow oval containing the chick-in-egg onto the background, I laid the grass in place. Using Stampin' Dimensionals, I popped up his little "hello" as well as the fallen eggshell. The panel was then adhered to a Whisper White card base. And I stamped "Happy Easter" inside the card. Adorable! Thanks so much for sharing it with us! It's cute! I love the chick and the piecing you did. See you Wednesday! 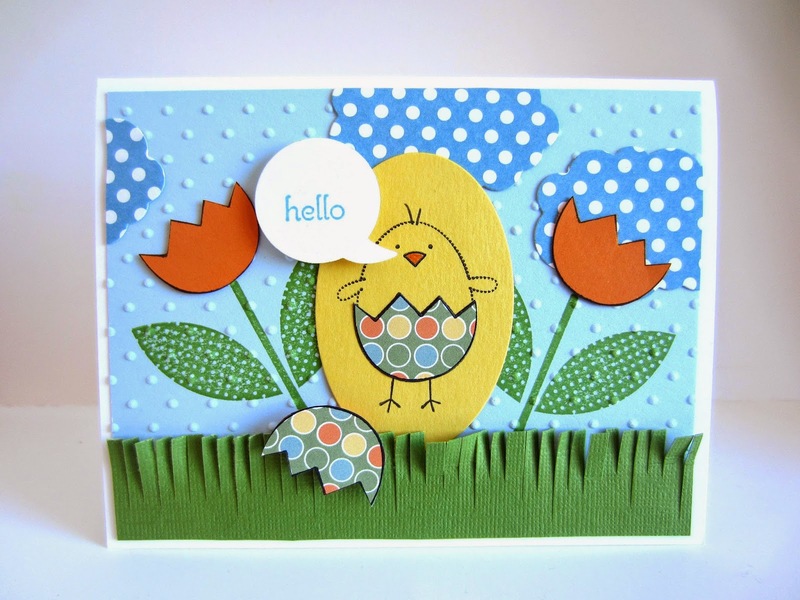 I love this card, so cute..
Popping over from Creative Monday blog hop.